Perhaps more so than any other sub-genre, black metal conjures the most debate for a variety of reasons. The splintering of the genre since the early ‘90s has seen division and derision as black metal manifests itself is many different forms outside of the Nordics and finds new fertile ground in different climes from the indubitably broad USBM scenes to Greece’s contributions or black metal of the South American variety. It may seem like beating a dead horse to reiterate the point that black metal has little or no structures anymore that are widely accepted by the different audiences, so much so that we split hairs and denounce musicians over what genre they actually are. Deafheaven, for example, will go down as a classic example and so too will many of their peers but the San Francisco band, whose core is BM, eschew every other facet of the genre that brought them to the ball, whether visually or sonically. It’s not without precedence but this age of black metal diversity, for better or worse, has spawned so many sub-sub-sub-genres that it’s becoming increasingly difficult to put your finger on anything anymore. Texas’ Funeralbloom are one such band. Aesthetically, top to bottom, they are an affront to the conventional black metal ways. The name at first glance urges a smirk, the artwork looks more like that of an indie rock record and musically they fit much more in the Deafheaven school of black metal that’s not black metal. 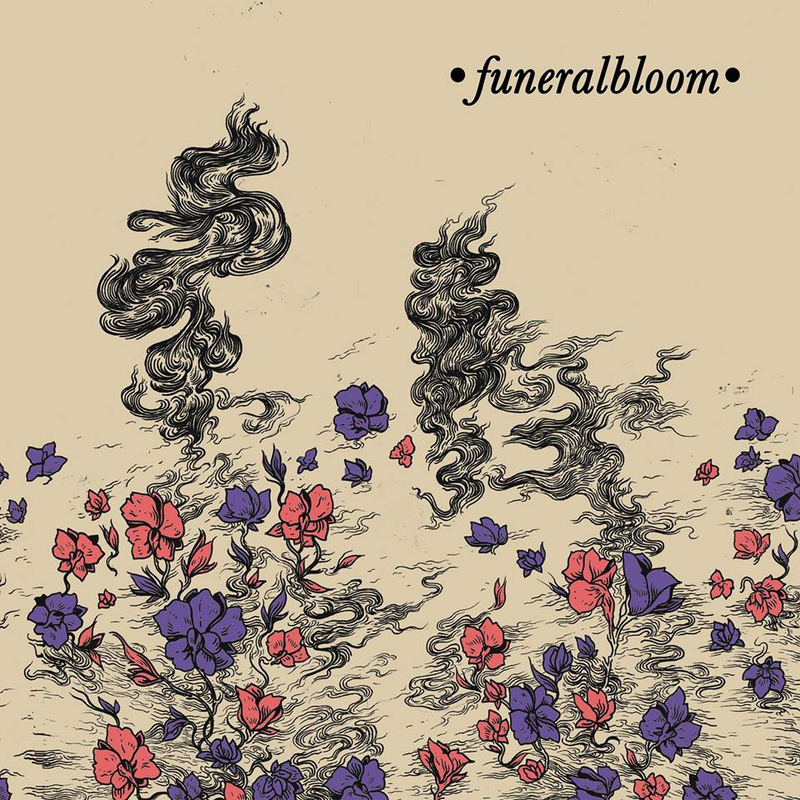 But unlike Deafheaven, Funeralbloom’s Petals is a natural sounding record, free of contrived notions and brimming with ideas. Not to harp on and on about what black metal is, but Funeralbloom are one of those bands that exist to challenge the norms of what the genre is or should be. Could you make a fair and strong argument that Funeralbloom are NOT black metal? Yes absolutely, but the genre remains as the foundation with a shoegazing structure upon it to create something of their own. There are obvious post rock vibes at play on Petals, with sleek melodies countering the juddering hail of blastbeats on 11 minute flurries like ‘Black Shoes’ or ‘Cherry Orchard’, which plucks out some Souvenirs d’un autre monde-era Alcest melodies. And crucially, despite the many vibrant and colourful tones at play on Petals, Funeralbloom maintain a consistent eerie atmosphere, never trading feeling for one extra riff for the sake of it. It’s a common ebb and flow in the guitar; and the vocals are no different, slotting in grandiose near-operatic wails in between the shrill shrieking (sometimes edging into screamo territory) you would expect, though it’s very much the latter that helms the record from start to finish. However, the careful shifts in vocals style add a new depth to the album that is often lost on bands of this ilk. The 14 minute ‘Lust’ for example strays completely away from the rest of the album’s tendencies and instead sounds like a moody, elongated, post-punk tune only for ‘Naked’ to completely unravel that new found style and kick in with convulsive drumming and riffing once again. Petals isn’t boundary pushing but it definitely it’s shoving at the very least. Funeralbloom are doing some genuinely interesting things with a model that’s been worn dry over the last two or three years and for that they deserve a hat tip. There’s definitely plenty to discover on this album. Tags: Funeralbloom, Petals. Bookmark the permalink.